The Revenue Committee advanced bills this session that would require online retailers to collect sales taxes on Nebraska transactions, create a tax credit for private school scholarship donations and provide more state aid to schools that rely on property taxes for a large portion of their funding. A proposal that would cut the state’s top income and corporate tax rates if projected state revenue growth meets certain targets and change the way agricultural land is assessed remains on general file. • LB338, introduced by Bancroft Sen. Lydia Brasch also on behalf of the governor, which would change the state’s method for valuing agricultural and horticultural land to an income-based approach. Nebraska’s top individual income tax rate would be reduced from 6.84 percent to 5.99 percent in increments of roughly 0.1 percent per year if projected state revenue growth exceeds 3.5 percent of the prior year’s actual revenue. The bill would reduce the state’s top corporate income tax rate from 7.81 percent to 7.59 percent in 2019 and then by 0.2 percent per year if projected state revenue growth exceeds 4 percent of the prior year’s actual revenue. Cuts would continue until the rate reaches 5.99 percent. To help pay for the cuts, the bill would phase out income tax credits for some high earners. LB461 also would suspend two tax credit programs: the New Markets Job Growth Investment Act and the Nebraska Job Creation and Mainstreet Revitalization Act. LB461 would give tax credits to low-income earners and increase the earned income tax credit from the current 10 percent to 11 percent in 2019 and 12 percent in 2020. The bill also calls for agricultural and horticultural land to be assessed using an income-based approach instead of the current market value approach beginning in 2018. A new committee led by the state tax commissioner would establish capitalization rates for each class of agricultural or horticultural land and the bill would cap annual growth in statewide aggregate agricultural value at 3.5 percent. 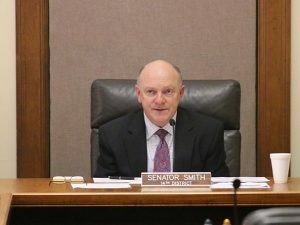 After six hours of debate on general file, Smith filed a motion to invoke cloture, or cease debate and vote on the bill. The motion failed 27-9. Thirty-three votes were needed. The committee advanced a bill that allows businesses that make large capital investments in Nebraska to carry over unused tax credits for a much longer period. LB161, introduced by Sen. Curt Friesen of Henderson, extends the tax credit carry-over period for companies that file a Tier 6 application under the Nebraska Advantage Act from one year to 16 years after the end of the entitlement period. The change applies to all Tier 6 project applications filed before, on or after the bill’s effective date. The bill passed on a 44-2 vote. A bill that would allow private donations to fund scholarships for students who attend private schools in Nebraska was advanced by the committee and remains on general file. LB295, introduced by Smith, would create a nonrefundable tax credit for those who donate money to nonprofit organizations that grant scholarships to students to attend a private elementary or secondary school in Nebraska. Only students from a household with an income less than twice the required level of the federal reduced-price lunch program would be eligible to receive scholarships. The committee also advanced a bill intended to increase the amount of financial information on state tax incentive programs that is available to the public. As introduced by Sen. John McCollister of Omaha, LB565 would require the state treasurer to add tax incentive program data to a website it maintains showing how the state spends tax dollars. Data on seven existing programs, including the Nebraska Advantage Act, and any future tax incentive programs meant to recruit or retain businesses in the state would be included. The bill remains on general file. A proposal to repeal a tax exemption for food sold at political events was approved this session. Introduced by Norfolk Sen. Jim Scheer and passed 44-0, LB63 eliminates a sales and use tax exemption for food sold at political events held by ballot question committees, independent committees and political party committees. A bill that would require some online retailers to collect state sales taxes on Nebraska transactions remains on select file. As introduced by Sen. Dan Watermeier of Syracuse, LB44 would require an online retailer without a physical presence in the state to collect and remit state sales taxes. A Watermeier amendment is pending on select file that would give online retailers the option to voluntarily collect and remit state sales taxes if their revenue exceeds $100,000 a year or they make 200 or more separate transactions in the state that year. If the seller opts not to collect the tax, it would be required to notify Nebraska purchasers that tax is due and that the state requires them to file a sales or use tax return on their purchases. Each failure to notify would result in a $5 penalty. A bill intended to encourage the formation and expansion of businesses on Native American reservations in the state also remains on select file. Under LB291, introduced by Sen. Tyson Larson of O’Neill, a qualified business could exclude from its income tax liability any income derived from sources within a special economic impact zone. As amended, the bill would allow businesses to exclude from sales and use taxes the first $250,000 in purchases of goods or services for use within a special economic impact zone each year. It would establish each reservation in the state as a special economic impact zone, as well as any trust land of an Indian tribe that lies within a federally designated service area. A business that engages in Class III gaming activity, derives more than 5 percent of its income from the sale of agricultural grain or relocates from one part of the state to a special economic impact zone would not be eligible for the incentives. A bill that would direct additional state aid to schools that rely on property taxes for more than 55 percent of their general fund revenue remains on general file. As introduced by Sen. Mike Groene of North Platte, LB640 would decrease the maximum levy for school districts and use money in a property tax credit fund — which is funded by state income and sales taxes — to increase state aid to districts that lose money as a result. A pending Revenue Committee amendment would replace the bill, reducing the maximum levy for school districts from $1.05 per $100 of taxable valuation of property in a district to 98.7 cents per $100 beginning in fiscal year 2018-19. A school district could qualify for property tax relief aid if its property tax receipts exceed 55 percent of its total revenue. A school district that receives property tax relief aid would decrease the amount of property taxes it collects by the same amount. For years in which a temporary reduction in aid is in place, a district could levy up to an additional 3 cents above the maximum levy after a public hearing and approval by two-thirds of the district’s board. Introduced by Sen. Sue Crawford of Bellevue, LB253 authorizes cities and counties to enter into agreements to plan, build, manage, operate and finance sewerage disposal systems. The bill also authorizes counties to use an existing 3.5-cent levy authority under the County Industrial Sewer Construction Act to secure bonds to pay for a new system. Senators voted 46-0 to pass the bill. A bill that would extend levy authority for certain natural resources districts (NRDs) remains on general file. Introduced by Friesen, LB98 would extend the three-cent levy authority for NRDs located in fully or over-appropriated river basins from fiscal year 2017-18 to FY2025-26. The levy may be used only for ground water management and integrated management programs under the Nebraska Ground Water Management and Protection Act. After approximately four hours of debate on general file, Friesen filed a motion to invoke cloture, or cease debate and vote on the bill. The motion failed 31-9. Thirty-three votes were needed. The committee amended a bill dealing with homestead exemptions to include the provisions of several other tax-related bills. LB217, introduced by Omaha Sen. Burke Harr, gives a property owner 30 days after a county assessor receives approval from a county board to remove or reduce a homestead exemption from the tax rolls to pay taxes owed without accruing interest. It also clarifies current law regarding the ownership and transfer of affordable housing tax credits. Passed 47-0, LB217 was amended to include provisions of the following seven bills. LB228, also introduced by Harr, requires the owner of a rent-restricted housing project to file an electronic statement containing income and expense data for the prior year and other information. It also requires the state Department of Revenue to forward those statements to the county assessor of each county in which a rent-restricted housing project is located. Smith introduced LB233, which makes several technical changes to current tax law. It updates statute related to raffles and lotteries; clarifies the method of claiming a tax credit for employers that hire former recipients under the Temporary Assistance for Needy Families program; and allows for the electronic filing of a report with the Property Tax Administrator regarding unused homestead exemption tax credits, among other changes. LB387, introduced by Lindstrom, makes several changes to programs administered by the state Department of Economic Development. It requires the department to make its best efforts to allocate at least 30 percent of funds from the Affordable Housing Trust Fund to each congressional district. LB49, introduced by Sen. Paul Schumacher of Columbus, requires the state tax commissioner to submit a report to the Legislature within 60 days of the enactment of an amendment to the Internal Revenue Code. The report will describe the changes and their impact on state revenue and on various classes of taxpayers. The requirement does not apply if the amendment’s impact on state revenue for that year is less than $5 million. LB238, introduced by Sen. Steve Erdman of Bayard, requires a county assessor to file a tax levy certification to a governing body or board by mail, electronically or by placing the certification on the county assessor’s website. LB288, also sponsored by Harr, makes technical changes to law governing tax sale certificates. Provisions of Harr’s LB251 also were incorporated. These require a parcel of land primarily used for agricultural or horticultural purposes to be assessed without regard to whether the parcel is platted and subdivided into separate lots.